The researchers have extensively tested and simulated four blend ratios of biodiesel, focusing on soy-based fuel, which is the most commonly used biodiesel fuel in the U.S.
An advanced “closed-loop control” approach for preventing diesel engines from emitting greater amounts of smog-causing oxides of nitrogen when running on biodiesel fuels has been developed by researchers from Purdue University and Cummins Inc.
Truck engines operating on a blend of biodiesel and ordinary diesel fuel dramatically reduce particulate-matter emissions, but even the most modern and efficient diesel mills can spew up to 40% more NOx at some operating conditions. Plus fuel economy declines by as much as 20%., the researchers say. Gregory M. Shaver, an assistant professor of mechanical engineering, says unlike conventional diesel, biodiesel contains oxygen and research shows this is responsible for the majority of the higher NOx emissions. Another key factor is a recent innovation called exhaust gas recirculation, which re-routes exhaust back into the engine cylinders to reduce emissions. The researchers found NOx emissions rise by a higher percentage in engines equipped with this exhaust-recirculation technology compared with older engines that do not. However, the newer engines still emit less NOx. Researchers at Purdue's Ray W. Herrick Laboratories used a Cummins 6.7L, 6-cyl. 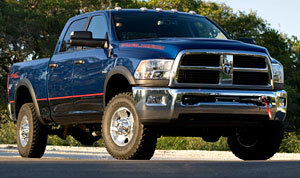 diesel engine for their research, a popular powerplant found in Dodge Ram pickup trucks. “We were able to improve the fuel economy with a biodiesel blend while reducing nitrogen oxides to where they were with conventional diesel,” Shaver says in a statement. Shaver says fuel economy still is problematic, however, because biodiesel has 10% to 12% lower “energy density,” or the amount of energy liberated during combustion, compared with regular diesel fuel. The researchers developed a physics-based, closed-loop control technique, which means the system uses advanced models to self-adjust engine settings based on feedback from sensors. Software algorithms use data from the sensors to determine the fuel blend being combusted. If the fuel is changed, the system identifies the new fuel and makes critical adjustments to fuel-injection timing, the air-to-fuel ratio and how much exhaust is rerouted into the cylinders. Most late-model cars and trucks already are equipped with both oxygen sensors in their exhaust systems and sophisticated electronic-control modules, making the technique applicable for both current and future vehicles, Shaver says. “It just adds another wrinkle or two of extra intelligence to an engine's electronic-control module,” he says. The researchers extensively tested and simulated four blend ratios of biodiesel, focusing on soy-based fuel, which is the most commonly used biodiesel fuel in the U.S. The approach also could be used for other types of fuels and engines, including advanced lean-burn gasoline engines running on ethanol blends. Purdue has filed one full patent and one provisional patent related to the technique. Shaver says the engine-control framework is ready for commercial use, and the researchers are working with engineers at Cummins.